New Delhi: 20/12/2014We, the members of the National United Christian Forum (NUCF) comprising the three leading Churches of India, i.e. The Catholic Bishops' Conference of India (CBCI), the National Council of Churches in India (NCCI) and the Evangelical Fellowship of India (EFI), together express our serious concern about the current situation of the minorities, particularly the Christians in India. The recent happenings in Bastar forcing the school to put the statue of Sarsawati Maa in a Catholic school and forbidding the children to address the principle with the honorific 'Father'; the burning of a church in Delhi; the declaration of 'Good Governance Day' on 25th December to undermine the importance of Christmas; the provocative call by some fundamentalists to convert 4000 Christians to Hinduism in Agra on Christmas Day and the regular targeting of the Christian community, calling them even anti-national is a cause of great concern for us. Letter to the Indian Prime Minister expressing concern over the "good-days" and "good-governance"
This letter is a continuation of the concerns expressed in the letter of 2nd December 2014 sent from the NCCI Secretariat. The NCCI is a council representing about 14 million Christians in India belonging to the Protestant and Orthodox Traditions in India. We are committed to unity, witness, service and exemplary practice in the country. As a well-read person, you are certainly aware of the tremendous contribution made by Christians of all traditions (Including Catholics), in history and up to the present, towards nation building through education, health care, orphanages, old people’s homes, counseling ministries, relief services provided during natural calamities, and the ongoing work for rehabilitation and development. The Church in India continues to be committed to the cause of dalits, tribal/adivasis, women, youth, children, the disabled, PLWA, mother earth - indeed all creation, particularly those who have been marginalized. We are committed to an India developed on the principles of justice and peace. “Guns of Darkness! Why would I not curse you? We cannot wipe away your tears but we want to let you know that we weep with you and feel your pain. We are shocked and pained to know about the murder of 132 innocent students and nine staff members who were killed on 16th December 2014 Tuesday by Taliban terrorists who entered a school in Peshawar. 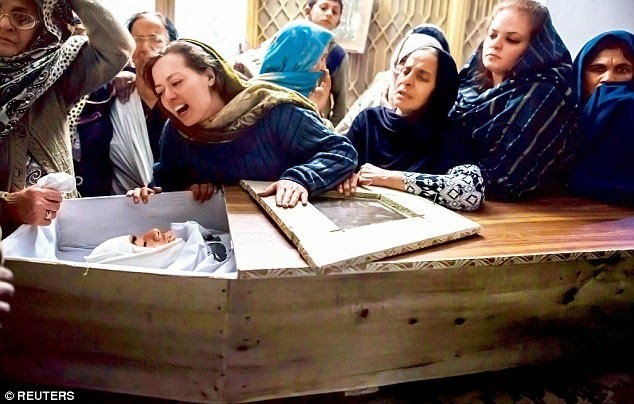 We are horrified to know that teachers were believed to be burnt alive while students were forced to watch as Taliban gunmen stormed the school in Pakistan. We can only imagine what trauma these innocent children might have gone through and what trauma you all and your country is going through now. 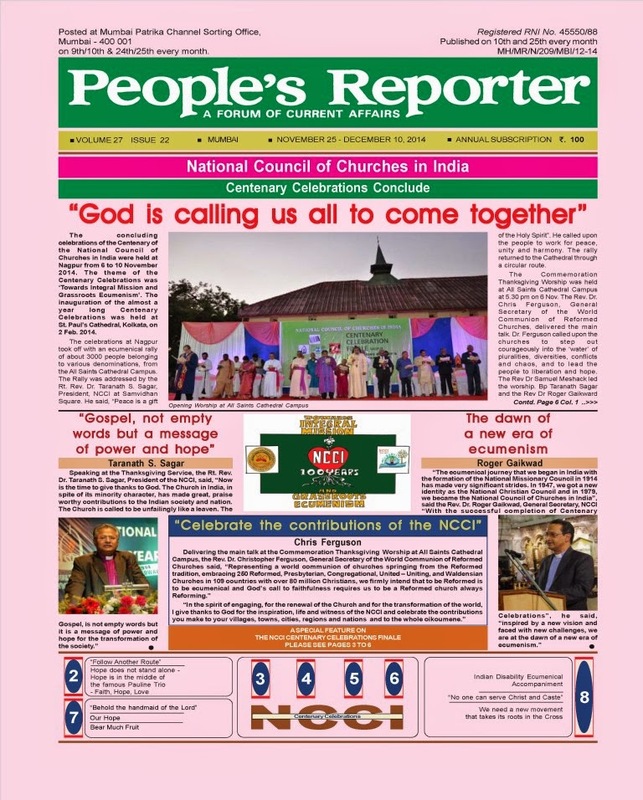 National Council of Churches in India Centenary Celebrations Finale featured in People's Reporter Volume 27, Issue 22 (November 25 - December 10, 2014). NCCI Centenary Celebrations Finale featured in People's Reporter Volume 27, Issue 22. Page 1 of 8. Click link below to view/download the full feature in pdf. The National Council of Churches in India is deeply saddened by the demise of the world renowned and a genuine Indian Human Right defender Honourable Justice. 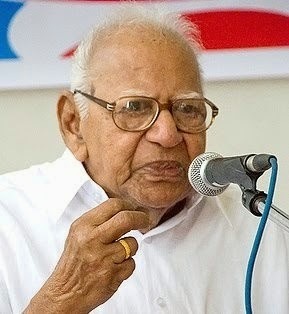 Dr. V. R. Krishna Iyer. Dr. V R Krishna Iyer was socially sensitized and spiritually kindled judiciary and a moral rebel against human injustice. He was a peace lover and a visionary. Regaining the lost identity in Christ”. 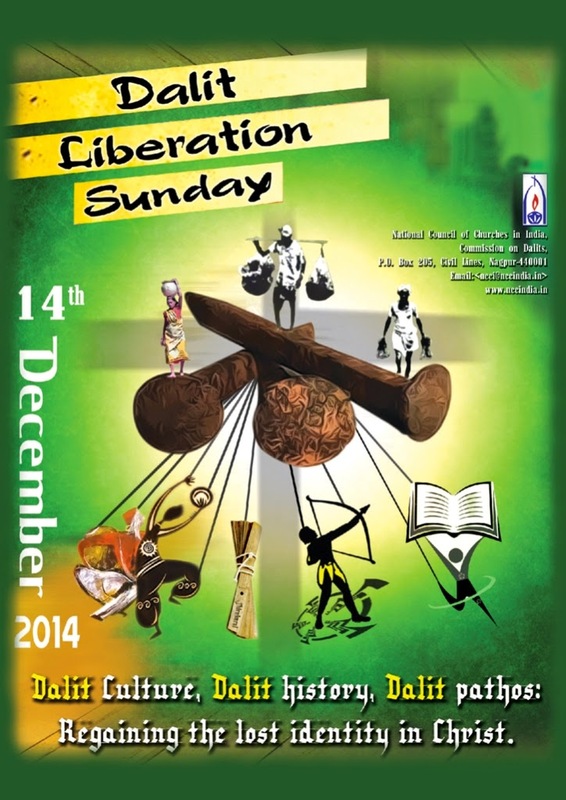 We are in a crucial point of time in the Indian history, while we celebrate the Dalit Liberation Sunday in 2014. The grip of fascism and communalism becomes firm on Indian society. These regressive and dangerous elements are only the tip of the iceberg and the undercurrent of all these elements in India is casteism. Forceful reconversions of the Dalit Christians, adamant denial of any possibility to extend Scheduled Caste status to Christians and Muslims from Dalit origin by a Central Minister of India, brutal killings of Dalits- in which Ahmednagar killing was the most brutal- and the lethargic attitude of police and the state in rendering investigation with justice, and the result of the survey conducted by the Merry Land University of US and National Council of Applied Economic Research that every fourth Indian still believes in untouchability are pointers to the dangerous shift in the Indian social matrix. The most unfortunate factor is that the church in India is not an exemption from caste- based discrimination. When the Indian society is becoming for and more rightist, and the church is hesitant to take a stand against it, the lives of the Dalits, Tribals, Adivasis and the vulnerable communities in India. The awakening of Dalits led by the Dalit intellectuals and theologians is the ray of hope amidst the tribulations for Dalits. Regaining the identity of Dalits using cultural ethos, rectified history by firmly focusing on the salvific acts of Christ is the theme of the Dalit Liberation Sunday in 2014. Let us celebrate the identity of Dalits in Christ! Commission on Dalits, NCCI. Commission on Dalits, NCCI. At the beginning of the service, a Dalit man/woman with little dress stands at a corner of the chapel. The minister sees him and invites him to the front side. He walks towards the front. 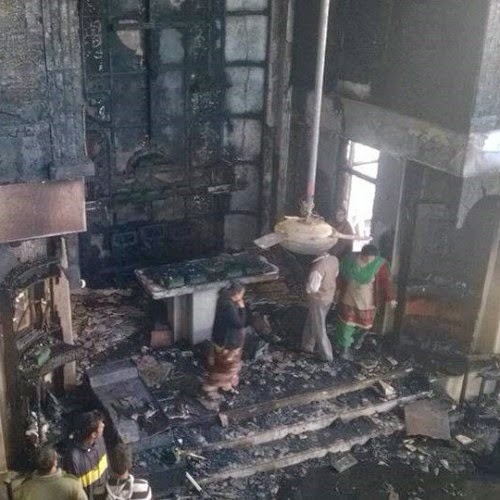 Top angle view of the damage inside St. Sebastian church in Delhi. Below is the text of a letter written to Indian Prime Minister by Rev. Dr. Roger Gaikwad, General Secretary of National Council of Churches in India. On behalf of the NCCI, I strongly urge you to take immediate measures to ensure that minority communities are not subject to attacks by fundamentalist communal groups. The Christian church in the country wants to see that democratic secularism in spirit and practice is strengthened by your government.